Despatch: From 7th May 2019. This super saver Sweet Potato Young Plant Collection consists of our three best Sweet Potatoes: Bonita, Murasaki and Beauregard, giving you a massive saving of £9.95! Sweet Potato Murasaki-This unique, purple-skinned and white-fleshed variety has a distinctly nutty flavour and is a little less sweet than other types with a high dry matter content, so delicious when baked. It matures in 90 to 110 days and is resistant to southern root knot nematode and Fusarium root rot. Sweet Potato Bonita-This variety has white skin and white flesh and is very high yielding and ready for harvesting in around 95 days. It is resistant to root rot nematode and grows well in most soils. The tubers have a lovely flavour and flaky texture when cooked. Sweet Potato Beauregard-Beauregard has attractive salmon/orange flesh, a smooth, creamy texture and a wonderfully sweet, almost nutty flavour. It is also really versatile – we enjoy it boiled, steamed, baked or fried. Sweet Potatoes have become very popular over the last few years and ever more of us are enjoying their unique flavour as part of a healthy and nutritious diet. They have no relation to potatoes, but are in fact a member of the morning glory (Ipomoea) family and do not contain as much starch, but are rich in Vitamins A, B, C and E and are a good source of iron and calcium. They are ideal for growing in large containers on a sunny patio or in a greenhouse or polytunnel and they do well outside, in milder areas, in free draining, sandy soil in full sun. The top growth of sweet potatoes doesn’t die back like a normal spud, but as a general rule, crops grown out in the border soil should be ready for harvesting around the end of September – those grown in patio containers in the greenhouse, mid-October. Once harvested, they are excellent keepers, and can be stored for several months to enjoy through the winter. 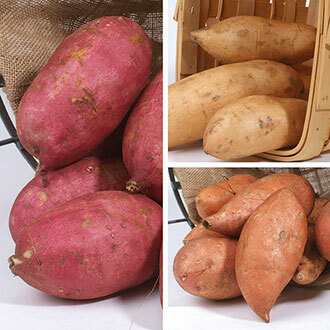 Sweet potatoes like it hot, they crop best when kept at temperatures between 20 and 27°C (70 to 80°F). So if you’re growing outside, start by warming the soil now with a covering of black polythene and then planting through holes in the plastic when you receive the plants. We recommend covering the plants with a cloche or fleece as the extra heat will make a real difference. If you are growing in a greenhouse or polytunnel, plant in containers or directly into beds and train the foliage up canes or string. They prefer well drained soil and will need regular watering and feeding, harvest in late autumn when the leaves have turned yellow and died back.